Use the HubSpot + Visible Integration to engage key stakeholders with professional dashboards and reports. 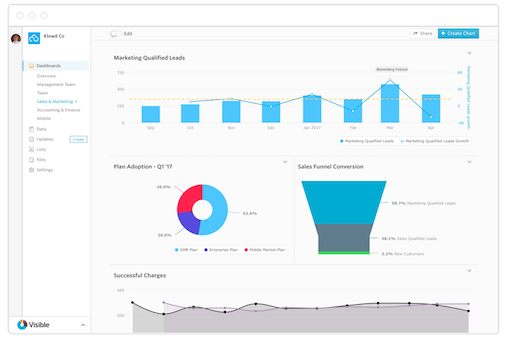 Quickly centralize, visualize, and distribute your key sales and marketing data using our beautiful Updates powered by your HubSpot data. Drill into your pipeline and uncover new insights. Share new deals, revenue, individual rep performance, etc. all in a few clicks. After you click "Connect" next to the HubSpot integration you will be prompted to authenticate your HubSpot account. 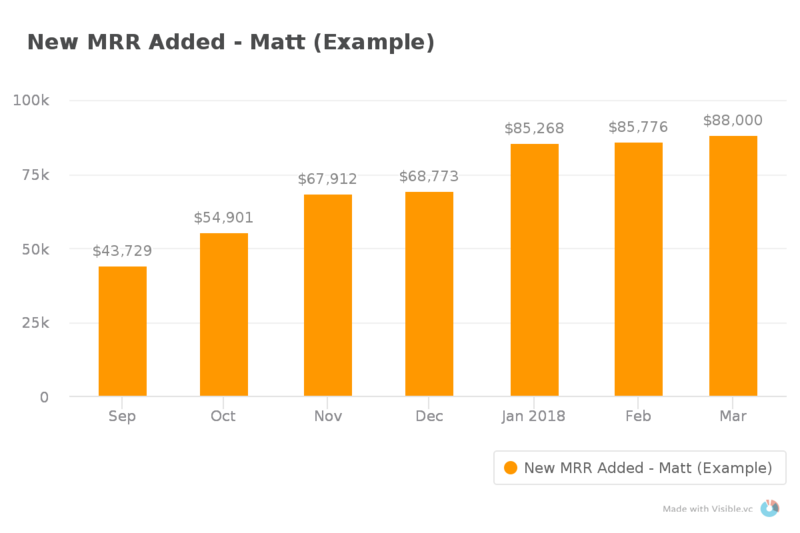 Once your account is authenticated we will display a window to create metrics using your HubSpot connection. 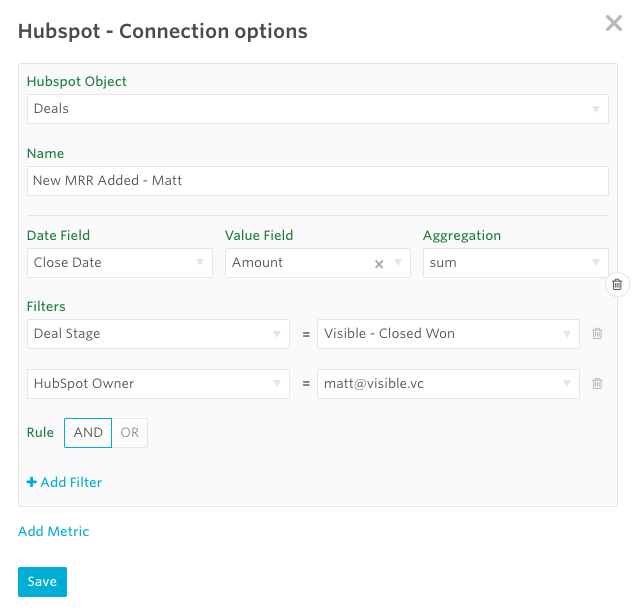 When creating a HubSpot metric you will see 4 fields to get started; HubSpot Object, Name, Date Field, and Value Field. HubSpot Object - Choose what object you would like to start with from HubSpot; Deals, Contacts, and Companies. Name - Simply the name of your new metric in Visible. Date Field - The date field is what you would like your new metric to be anchored to when counting/summing your new metric. For example - Create date, Converted to XYZ date, etc. Value Field - The value field is how you would like to "count" your new data. 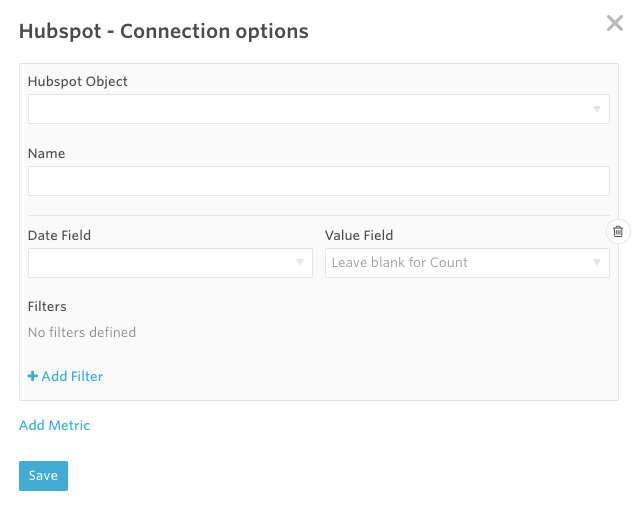 You can leave this field blank for a simple count or create data using your numeric fields in HubSpot. For example - using the "Value" for a Deal to create Revenue. Once you have the parameters for your Metric set you will be able to filter your Metric using your unique HubSpot fields as well; Stage, Type, HubSpot owner, etc. You can add as many filters as you would like using our and/or feature. 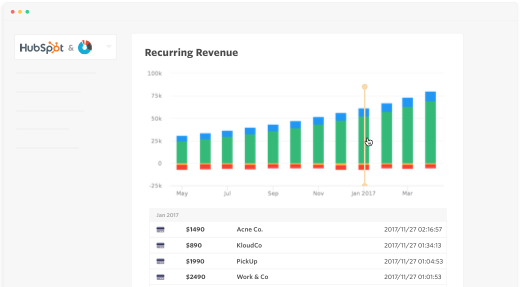 Because we are counting "New MRR (Revenue)" we will be starting with "Deals" as our object as that is where we track our closed won revenue. We will anchor the data on the "Close Date" and use "Amount" as our "Value Field" as that is where we are tracking the monthly value of the new contract. From here, we filtered the "Deal Stage" to "Closed Won" and "HubSpot Owner" to the individual rep.
Once the parameters are in the place, simply click "Save" and we will immediately bring in your new data points. We will bring in the data on a nightly basis and track it as daily data points in Visible.